Renaissance Europeans were quite admiring of Japan when they reached the country in the 16th century. Japan was considered a country immensely rich in precious metals, a view that owed its conception mainly to Marco Polo's accounts of gilded temples and palaces, but also due to the relative abundance of surface ores characteristic of a volcanic country, before large-scale deep-mining became possible in Industrial times. Japan was to become a major exporter of copper and silver during the period. Japan was also perceived as a sophisticated feudal society with a high culture and advanced pre-industrial technology. It was densely populated and urbanized. Prominent European observers of the time seemed to agree that the Japanese "excel not only all the other Oriental peoples, they surpass the Europeans as well" (Alessandro Valignano, 1584, "Historia del Principo y Progresso de la Compania de Jesus en las Indias Orientales). Early European visitors were amazed by the quality of Japanese craftsmanship and metalsmithing. This stems from the fact that Japan itself is rather poor in natural resources found commonly in Europe, especially iron. Thus, the Japanese were famously frugal with their consumable resources; what little they had they used with expert skill. The cargo of the first Portuguese ships (usually about four small ships every year) that arrived in Japan consisted almost entirely of Chinese goods (silk, porcelain). 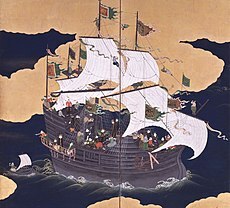 The Japanese were very much looking forward to acquiring such goods, but had been prohibited from any contacts with the Emperor of China, as a punishment for Wakō pirate raids. The Portuguese (who were called Nanban, lit. Southern Barbarians) therefore found the opportunity to act as intermediaries in Asian trade. From the time of the acquisition of Macau in 1557, and their formal recognition as trade partners by the Chinese, the Portuguese started to regulate trade to Japan, by selling to the highest bidder the annual "Captaincy" to Japan, in effect conferring exclusive trading rights for a single carrack bound for Japan every year. The carracks were very large ships, usually between 1000 and 1500 tons, about double or triple the size of a large galleon or junk. That trade continued with few interruptions until 1638, when it was prohibited on the ground that the ships were smuggling priests into Japan. Portuguese trade was progressively more and more challenged by Chinese smugglers on junks, Japanese Red Seal Ships from around 1592 (about ten ships per year), Spanish ships from Manila from around 1600 (about one ship per year), the Dutch from 1609, and the English from 1613 (about one ship per year). The Dutch, who, rather than "Nanban" were called "Kōmō" (Jp:紅毛, lit. "Red Hair") by the Japanese, first arrived in Japan in 1600, on board the Liefde. Their pilot was William Adams, the first Englishman to reach Japan. In 1605, two of the Liefde's crew were sent to Pattani by Tokugawa Ieyasu, to invite Dutch trade to Japan. The head of the Pattani Dutch trading post, Victor Sprinckel, refused on the ground that he was too busy dealing with Portuguese opposition in Southeast Asia. In 1609 however, the Dutch Jacques Specx arrived with two ships in Hirado, and through Adams obtained trading privileges from Ieyasu. 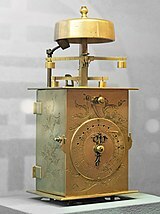 A Japanese-made clockwatch of the 18th century, or Wadokei. Then time changed in the season because from sunrise to sunset made 12 hours and from sunset to sunrise made 12 hours. The beginning of the Edo period coincides with the last decades of the Nanban trade period, during which intense interaction with European powers, on the economic and religious plane, took place. At the beginning of the Edo period, Japan built her first ocean-going Western-style warships, such as the San Juan Bautista, a 500-ton galleon-type ship that transported a Japanese embassy headed by Hasekura Tsunenaga to the Americas, and then continued to Europe. Also during that period, the bakufu commissioned around 350 Red Seal Ships, three-masted and armed trade ships, for intra-Asian commerce. Japanese adventurers, such as Yamada Nagamasa, were active throughout Asia. In order to eradicate the influence of Christianization, Japan entered in a period of isolation called sakoku, during which its economy enjoyed stability and mild progress. But not long after, in the 1650s, the production of Japanese export porcelain increased greatly when civil war put the main Chinese center of porcelain production, in Jingdezhen, out of action for several decades. For the rest of the 17th century most Japanese porcelain production was in Kyushu for export through the Chinese and Dutch. The trade dwindled under renewed Chinese competition by the 1740s, before resuming after the opening of Japan in the mid-19th century. By the mid-18th century, Edo had a population of more than 1 million and Osaka and Kyoto each had more than 400,000 inhabitants. Many other castle towns grew as well. Osaka and Kyoto became busy trading and handicraft production centers, while Edo was the center for the supply of food and essential urban consumer goods. Rice was the base of the economy, as the daimyō collected the taxes from the peasants in the form of rice. Taxes were high, about 40% of the harvest. The rice was sold at the fudasashi market in Edo. To raise money, the daimyō used forward contracts to sell rice that was not yet harvested. These contracts were similar to modern futures trading. After 1854, when the Tokugawa shogunate first opened the country to Western commerce and influence (Bakumatsu), Japan went through two periods of economic development. When the Tokugawa shogunate was overthrown and the Meiji government was founded, Japanese Westernization began completely. The first term is during Pre-war Japan, the second term is Post-war Japan. The industrial revolution first appeared in textiles, including cotton and especially silk, which was based in home workshops in rural areas. By the 1890s, Japanese textiles dominated the home markets and competed successfully with British products in China and India, as well. Japanese shippers were competing with European traders to carry these goods across Asia and even to Europe. As in the West, the textile mills employed mainly women, half of them under age twenty. They were sent there by their fathers, and they turned over their wages to their fathers. Japan largely skipped water power and moved straight to steam powered mills, which were more productive, and which created a demand for coal. One of the biggest impacts on the economy that the Meiji period brought was the end of the feudal system. With a relatively loose social structure, the Japanese people were able to advance through the ranks of society more easily than before. They were able to do this by inventing and selling their own wares. More important was the fact that the Japanese people now had the ability to become more educated. With a more educated population, Japan's industrial sector grew significantly. Implementing the Western ideal of capitalism into the development of technology and applying it to their military helped make Japan into both a militaristic and economic powerhouse by the beginning of the 20th century. In the Meiji period, leaders inaugurated a new Western-based education system for all young people, sent thousands of students to the United States and Europe, and hired more than 3,000 Westerners to teach modern science, mathematics, technology, and foreign languages in Japan (O-yatoi gaikokujin). The government also built railroads, improved roads, and inaugurated a land reform program to prepare the country for further development. To promote industrialization, the government decided that, while it should help private business to allocate resources and to plan, the private sector was best equipped to stimulate economic growth. The greatest role of government was to help provide the economic conditions in which business could flourish. In short, government was to be the guide, and business the producer. In the early Meiji period, the government built factories and shipyards that were sold to entrepreneurs at a fraction of their value. Many of these businesses grew rapidly into the larger conglomerates. Government emerged as chief promoter of private enterprise, enacting a series of pro-business policies. The development of banking and reliance on bank funding have been at the centre of Japanese economic development at least since the Meiji era. By 1928, the GNP of Japan at current prices peaked at ¥16,506 million. In the mid-1930s, the Japanese nominal wage rates were a tenth of those in the United States (based on mid-1930s exchange rates), while the price level is estimated to have been about 44% that of the US. Before World War II, Japan built an extensive empire that included Taiwan, Korea, Manchuria, and parts of northern China. The Japanese regarded this sphere of influence as a political and economic necessity, preventing foreign states from strangling Japan by blocking its access to raw materials and crucial sea-lanes, as Japan possessed very few natural and mining resources of its own, although it imported large amounts of coal from Korea, Manchukuo, and some regions of occupied China. Japan's large military force was regarded as essential to the empire's defense. Rapid growth and structural change characterized Japan's two periods of economic development since 1868. In the first period, the economy grew only moderately at first and relied heavily on traditional agriculture to finance modern industrial infrastructure. When the Russo-Japanese War began in 1904, 65% of employment and 38% of the gross domestic product (GDP) was still based on agriculture but modern industry had begun to expand substantially. During World War I, Japan used the absence of the war-torn European competitors on the world market to advance its economy, generating a trade surplus for the first time since the isolation in the Edo period. By the late 1920s, manufacturing and mining contributed 23% of GDP, compared with 21% for all of agriculture. Transportation and communications had developed to sustain heavy industrial development. In the 1930s, the Japanese economy suffered less from the Great Depression than most industrialized nations, its GDP expanding at the rapid rate of 5% per year. Manufacturing and mining came to account for more than 30% of GDP, more than twice the value for the agricultural sector. Most industrial growth, however, was geared toward expanding the nation's military power. Beginning in 1937 with significant land seizures in China, and to a greater extent after 1941, when annexations and invasions across Southeast Asia and the Pacific created the Greater East Asia Co-Prosperity Sphere, the Japanese government sought to acquire and develop critical natural resources in order to secure economic independence. Among the natural resources that Japan seized and developed were: coal in China, sugarcane in the Philippines, petroleum from the Dutch East Indies and Burma, and tin and bauxite from the Dutch East Indies and Malaya. Japan also purchased the rice production of Thailand, Burma, and Cochinchina. During the early stages of Japan's expansion, the Japanese economy expanded considerably. Steel production rose from 6,442,000 tonnes to 8,838,000 tonnes over the same time period. In 1941 Japanese aircraft industries had the capacity to manufacture 10,000 aircraft per year. Much of this economic expansion benefited the "zaibatsu", large industrial conglomerates. Over the course of the Pacific War, the economies of Japan and its occupied territories all suffered severely. Inflation was rampant; Japanese heavy industry, forced to devote nearly all its production to meeting military needs, was unable to meet the commercial requirements of Japan (which had previously relied on trade with Western countries for their manufactured goods). Local industries were unable to produce at high enough levels to avoid severe shortfalls. Furthermore, maritime trade, upon which the Empire depended greatly, was sharply curtailed by damage to the Japanese merchant fleet over the course of the war. By the end of the war, what remained of the Japanese Empire was wracked by shortages, inflation, and currency devaluation. Transport was nearly impossible, and industrial production in Japan's shattered cities ground to a halt. The destruction wrought by the war eventually brought the Japanese economy to a virtual standstill. The war wiped out many of the gains which Japan had made since 1868. About 40% of the nation's industrial plants and infrastructure were destroyed, and production reverted to levels of about fifteen years earlier. The people were shocked by the devastation and swung into action. New factories were equipped with the best modern machines, giving Japan an initial competitive advantage over the victor states, who now had older factories. As Japan's second period of economic development began, millions of former soldiers joined a well-disciplined and highly educated work force to rebuild Japan. Japan's colonies were lost as a result of World War II, but since then the Japanese had extended their economic influence throughout Asia and beyond. The United States' occupation of Japan (1945–52) resulted in the rebuilding of the nation and the creation of a democratic nation. US assistance totaled about US$1.9 billion during the occupation, or about 15% of the nation's imports and 4% of GNP in that period. About 59% of this aid was in the form of food, 15% in industrial materials, and 12% in transportation equipment. US grant assistance, however, tapered off quickly in the mid-1950s. US military procurement from Japan peaked at a level equivalent to 7% of Japan's GNP in 1953 and fell below 1% after 1960. A variety of United States-sponsored measures during the occupation, such as land reform, contributed to the economy's later performance by increasing competition. In particular, the post-war purge of industrial leaders allowed new talent to rise in the management of the nation's rebuilt industries. Finally, the economy benefited from foreign trade because it was able to expand exports rapidly enough to pay for imports of equipment and technology without falling into debt, as had a number of developing nations in the 1980s. A 2018 study, using the synthetic control method whereby Japan is compared to "synthetic Japan" (a combination of which are similar to Japan but without the US alliance), found that the US alliance allowed Japan's GDP to "grow much faster" from 1958-68. The early post-war years were devoted to rebuilding lost industrial capacity: major investments were made in electric power, coal, steel, and chemicals. By the mid-1950s, production matched prewar levels. Released from the demands of military-dominated government, the economy not only recovered its lost momentum but also surpassed the growth rates of earlier periods. Between 1953 and 1965, GDP expanded by more than 9% per year, manufacturing and mining by 13%, construction by 11%, and infrastructure by 12%. In 1965 these sectors employed more than 41% of the labor force, whereas only 26% remained in agriculture. Japan's highly acclaimed post-war education system contributed strongly to the modernizing process. The world's highest literacy rate and high education standards were major reasons for Japan's success in achieving a technologically advanced economy. Japanese schools also encouraged discipline, another benefit in forming an effective work force. The mid-1960s ushered in a new type of industrial development as the economy opened itself to international competition in some industries and developed heavy and chemical manufactures. Whereas textiles and light manufactures maintained their profitability internationally, other products, such as automobiles, electronics, ships, and machine tools assumed new importance. The value added to manufacturing and mining grew at the rate of 17% per year between 1965 and 1970. Growth rates moderated to about 8% and evened out between the industrial and service sectors between 1970 and 1973, as retail trade, finance, real estate, information technology, and other service industries streamlined their operations. Japan faced a severe economic challenge in the mid-1970s. The 1973 oil crisis shocked an economy that had become dependent on imported petroleum. Japan experienced its first post-war decline in industrial production, together with severe price inflation. The recovery that followed the first oil crisis revived the optimism of most business leaders, but the maintenance of industrial growth in the face of high energy costs required shifts in the industrial structure. Changing price conditions favored conservation and alternative sources of industrial energy. Although the investment costs were high, many energy-intensive industries successfully reduced their dependence on oil during the late 1970s and 1980s and enhanced their productivity. Advances in microcircuitry and semiconductors in the late 1970s and 1980s led to new growth industries in consumer electronics and computers, and to higher productivity in pre-established industries. The net result of these adjustments was to increase the energy efficiency of manufacturing and to expand knowledge-intensive industries. The service industries expanded in an increasingly postindustrial economy. Structural economic changes, however, were unable to check the slowing of economic growth as the economy matured in the late 1970s and 1980s, attaining annual growth rates at only 4–6%. But these rates were remarkable in a world of expensive petroleum and in a nation of few natural resources. Japan's average growth rate of 5% in the late 1980s, for example, was far higher than the 3.8% growth rate of the United States. Despite more petroleum price increases in 1979, the strength of the Japanese economy was apparent. It expanded without the double-digit inflation that afflicted other industrial nations (and that had bothered Japan itself after the first oil crisis in 1973). Japan experienced slower growth in the mid-1980s, but its demand-sustained economic boom of the late 1980s revived many troubled industries. Complex economic and institutional factors affected Japan's post-war growth. First, the nation's prewar experience provided several important legacies. The Tokugawa period (1600–1867) bequeathed a vital commercial sector in burgeoning urban centers, a relatively well-educated elite (although one with limited knowledge of European science), a sophisticated government bureaucracy, productive agriculture, a closely unified nation with highly developed financial and marketing systems, and a national infrastructure of roads. The buildup of industry during the Meiji period to the point where Japan could vie for world power was an important prelude to post-war growth from 1955 to 1973, and provided a pool of experienced labor. Second, and more important, was the level and quality of investment that persisted through the 1980s. Investment in capital equipment, which averaged more than 11% of GNP during the prewar period, rose to about 20% of GNP during the 1950s and to more than 30% in the late 1960s and 1970s. During the economic boom of the late 1980s, the rate still hovered around 20%. Japanese businesses imported the latest technologies to develop the industrial base. As a latecomer to modernization, Japan was able to avoid some of the trial and error earlier needed by other nations to develop industrial processes. In the 1970s and 1980s, Japan improved its industrial base through licensing from the US, patent purchases, and imitation and improvement of foreign inventions. In the 1980s, industry stepped up its research and development, and many firms became famous for their innovations and creativity. Japan's labor force contributed significantly to economic growth, because of its availability and literacy, and also because of its reasonable wage demands. Before and immediately after World War II, the transfer of numerous agricultural workers to modern industry resulted in rising productivity and only moderate wage increases. As population growth slowed and the nation became increasingly industrialized in the mid-1960s, wages rose significantly. However, labor union cooperation generally kept salary increases within the range of gains in productivity. High productivity growth played a key role in post-war economic growth. The highly skilled and educated labor force, extraordinary savings rates and accompanying levels of investment, and the low growth of Japan's labor force were major factors in the high rate of productivity growth. The nation also benefited from economies of scale. Although medium-sized and small enterprises generated much of the nation's employment, large facilities were the most productive. Many industrial enterprises consolidated to form larger, more efficient units. Before World War II, large holding companies formed wealth groups, or zaibatsu, which dominated most industry. The zaibatsu were dissolved after the war, but keiretsu—large, modern industrial enterprise groupings—emerged. The coordination of activities within these groupings and the integration of smaller subcontractors into the groups enhanced industrial efficiency. Japanese corporations developed strategies that contributed to their immense growth. Growth-oriented corporations that took chances competed successfully. Product diversification became an essential ingredient of the growth patterns of many keiretsu. Japanese companies added plant and human capacity ahead of demand. Seeking market share rather than quick profit was another powerful strategy. Finally, circumstances beyond Japan's direct control contributed to its success. International conflicts tended to stimulate the Japanese economy until the devastation at the end of World War II. The Russo-Japanese War (1904–05), World War I (1914–18), the Korean War (1950–53), and the Second Indochina War (1954–75) brought economic booms to Japan. In addition, benign treatment from the United States after World War II facilitated the nation's reconstruction and growth. As late as 1955, some 40% of the labor force still worked in agriculture, but this figure had declined to 17% by 1970 and to 7.2% by 1990 and under 5% in the 21st century as Japan imported more and more of its food and small family farms disappeared. Japan's economic growth in the 1960s and 1970s was based on the rapid expansion of heavy manufacturing in such areas as automobiles, steel, shipbuilding, chemicals, and electronics. The secondary sector (manufacturing, construction, and mining) expanded to 35.6% of the work force by 1970. By the late 1970s, however, the Japanese economy began to move away from heavy manufacturing toward a more service-oriented (tertiary sector) base. During the 1980s, jobs in wholesaling, retailing, finance, insurance, real estate, transportation, communications, and government grew rapidly, while secondary-sector employment remained stable. The tertiary sector grew from 47% of the work force in 1970 to 59.2% in 1990. Throughout the 1970s, Japan had the world's third largest gross national product (GNP)—just behind the United States and Soviet Union—and ranked first among major industrial nations in 1990 in per capita GNP at US$23,801, up sharply from US$9,068 in 1980. After a mild economic slump in the mid-1980s, Japan's economy began a period of expansion in 1986 that continued until it again entered a recessionary period in 1992. Economic growth averaging 5% between 1987 and 1989 revived industries, such as steel and construction, which had been relatively dormant in the mid-1980s, and brought record salaries and employment. In 1992, however, Japan's real GNP growth slowed to 1.7%. Even industries such as automobiles and electronics that had experienced phenomenal growth in the 1980s entered a recessionary period in 1992. The domestic market for Japanese automobiles shrank at the same time that Japan's share of the United States' market declined. Foreign and domestic demand for Japanese electronics also declined, and Japan seemed on the way to losing its leadership in the world semiconductor market to the United States, Korea and Taiwan. Unlike the economic booms of the 1960s and 1970s, when increasing exports played the key role in economic expansion, domestic demand propelled the Japanese economy in the late 1980s. This development involved fundamental economic restructuring, moving from dependence on exports to reliance on domestic demand. The boom that started in 1986 was generated by the decisions of companies to increase private plant and equipment spending and of consumers to go on a buying spree. Japan's imports grew at a faster rate than exports. Japanese post-war technological research was carried out for the sake of economic growth rather than military development. The growth in high-technology industries in the 1980s resulted from heightened domestic demand for high-technology products such as electronics, and for higher living, housing, and environmental standards; better medical care and more welfare; expanded leisure-time facilities; and improved ways to accommodate a rapidly aging society. During the 1980s, the Japanese economy shifted its emphasis from primary and secondary activities (notably agriculture, manufacturing, and mining) to processing, with telecommunications and computers becoming increasingly vital. Information became an important resource and product, central to wealth and power. The rise of an information-based economy was led by major research in highly sophisticated technology, such as advanced computers. The selling and use of information became very beneficial to the economy. Tokyo became a major financial center, home to some of the world's major banks, financial firms, insurance companies, and the world's largest stock exchange, the Tokyo Securities and Stock Exchange. Even here, however, the recession took its toll. In 1992, the Nikkei 225 stock average began the year at 23,000 points, but fell to 14,000 points in mid-August before leveling off at 17,000 by the end of the year. In the decades following World War II, Japan implemented stringent tariffs and policies to encourage the people to save their income. With more money in banks, loans and credit became easier to obtain, and with Japan running large trade surpluses, the yen appreciated against foreign currencies. This allowed local companies to invest in capital resources more easily than their overseas competitors, which reduced the price of Japanese-made goods and widened the trade surplus further. And, with the yen appreciating, financial assets became lucrative. With so much money readily available for investment, speculation was inevitable, particularly in the Tokyo Stock Exchange and the real estate market. The Nikkei stock index hit its all-time high on 29 December 1989 when it reached an intra-day high of 38,957.44 before closing at 38,915.87. The rates for housing, stocks, and bonds rose so much that at one point the government issued 100-year bonds. Additionally, banks granted increasingly risky loans. At the height of the bubble, real estate was extremely over-valued. Prices were highest in Tokyo's Ginza district in 1989, with choice properties fetching over US$1.5 million per square meter ($139,000 per square foot). Prices were only slightly less in other areas of Tokyo. By 2004, prime "A" property in Tokyo's financial districts had slumped and Tokyo's residential homes were a fraction of their peak, but still managed to be listed as the most expensive real estate in the world. Trillions were wiped out with the combined collapse of the Tokyo stock and real estate markets. With Japan's economy driven by its high rates of reinvestment, this crash hit particularly hard. Investments were increasingly directed out of the country, and Japanese manufacturing firms lost some degree of their technological edge. As Japanese products became less competitive overseas, some people argue that the low consumption rate began to bear on the economy, causing a deflationary spiral. The easily obtainable credit that had helped create and engorge the real-estate bubble continued to be a problem for several years to come, and as late as 1997, banks were still making loans that had a low guarantee of being repaid. Loan Officers and Investment staff had a hard time finding anything to invest in that would return a profit. Meanwhile, the extremely low interest rate offered for deposits, such as 0.1%, meant that ordinary Japanese savers were just as inclined to put their money under their beds as they were to put it in savings accounts. Correcting the credit problem became even more difficult as the government began to subsidize failing banks and businesses, creating many so-called "zombie businesses". Eventually a carry trade developed in which money was borrowed from Japan, invested for returns elsewhere and then the Japanese were paid back, with a nice profit for the trader. The time after the bubble's collapse (崩壊, hōkai), which occurred gradually rather than catastrophically, is known as the "lost decade or end of the 20th century" (失われた10年, ushinawareta jūnen) in Japan. The Nikkei 225 stock index eventually bottomed out at 7603.76 in April 2003, moved upward to a new peak of 18,138 in June 2007, before resuming a downward trend. The downward movement in the Nikkei is likely due to global as well as national economic problems. Deflation in Japan started in the early 1990s. On 19 March 2001, the Bank of Japan and the Japanese government tried to eliminate deflation in the economy by reducing interest rates (part of their 'quantitative easing' policy). Despite having interest rates near zero for a long period, this strategy did not succeed. Once the near-zero interest rates failed to stop deflation, some economists, such as Paul Krugman, and some Japanese politicians spoke of deliberately causing (or at least creating the fear of) inflation. In July 2006, the zero-rate policy was ended. In 2008, the Japanese Central Bank still had the lowest interest rates in the developed world and deflation continued. Fallen asset prices. There was a large price bubble in both equities and real estate in Japan in the 1980s (peaking in late 1989). Insolvent companies: Banks lent to companies and individuals that invested in real estate. When real estate values dropped, many loans went unpaid. The banks could try to collect on the collateral (land), but due to reduced real estate values, this would not pay off the loan. Banks have delayed the decision to collect on the collateral, hoping asset prices would improve. These delays were allowed by national banking regulators. Some banks make even more loans to these companies that are used to service the debt they already have. This continuing process is known as maintaining an "unrealized loss", and until the assets are completely revalued and/or sold off (and the loss realized), it will continue to be a deflationary force in the economy. Insolvent banks: Banks with a large percentage of their loans which are "non-performing" (loans for which payments are not being made), but have not yet written them off. These banks cannot lend more money until they increase their cash reserves to cover the bad loans. Thus the number of loans is reduced sooner and less funds are available for economic growth. Fear of insolvent banks: Japanese people are afraid that banks will collapse so they prefer to buy gold or (United States or Japanese) Treasury bonds instead of saving their money in a bank account. People also save by investing in real estate. The Economist has suggested that improvements to bankruptcy law, land transfer law, and tax law will aid Japan's economy. In October 2009 the Japanese government announced plans to increase tobacco and green taxes while reducing rates for small and medium-sized companies, according to NHK. In 2011 Japan under Yoshihiko Noda decided to consider joining the Trans-Pacific Strategic Economic Partnership. The global economic recession of the late 2000s significantly harmed the economy of Japan. The nation suffered a 0.7% loss in real GDP in 2008 followed by a severe 5.2% loss in 2009. In contrast, the data for world real GDP growth was a 3.1% hike in 2008 followed by a 0.7% loss in 2009. Economic policy over the past several quarters in Japan has been influenced by the 'Abenomics' debate, with the government pursuing aggressive government infrastructure spending hikes and significant yen devaluations. 1990s, "the Lost Decade", as it is known in Japan, is the time after Japan's economic bubble collapsed. The Nikkei 225 stock index bottomed out at 7603.76 in April 2003, moved upward to a new peak of 18,138 in June 2007, before resuming a downward trend. Abenomics, Japan's Prime Minister Shinzō Abe's programme to help the country's economic recovery: the economics side is one part of a more general programme, which was commented by Joseph Stiglitz. ^ "Wonders and Whoppers / People & Places / Smithsonian". Retrieved 17 October 2014. ^ Smith, R.B (12 May 2014). Asia in the Making of Europe, Volume III: A Century of Advance. Book 3 ... - Donald F. Lach, Edwin J. Van Kley - Google Livros. ISBN 9781136604720. Retrieved 17 October 2014. ^ "Dutch-Japanese relations / Netherlands Missions, Japan". Retrieved 17 October 2014. ^ "Japan Answers the Challenge of the Western World". The Meiji Restoration and Modernization. Columbia University. Retrieved 3 September 2012. ^ a b Fukao, Kyoji (2007). Real GDP in Pre-War East Asia: A 1934–36 Benchmark Purchasing Power Parity Comparison with the US (PDF). ^ Liu, Ta-Chung (1946). China's National Income 1931–36, An Exploratory Study. The Brookings Institution. ^ Maddison, Angus (2003). The World Economy: Historical Statistics. OECD Development Center, Paris, France. ^ Gordon, Andrew, ed. (1993). Postwar Japan as History. University of California Press. pp. 99–188, 259–92. ^ Beckley, Michael; Horiuchi, Yusaku; Miller, Jennifer M. (2018). "AMERICA'S ROLE IN THE MAKING OF JAPAN'S ECONOMIC MIRACLE". Journal of East Asian Studies: 1–21. doi:10.1017/jea.2017.24. ISSN 1598-2408. ^ Mikio Sumiya (2000). A History of Japanese Trade and Industry Policy. Oxford UP. p. 158. ISBN 9780191584022. ^ Gary D. Allinson (2004). Japan's Postwar History. Cornell UP. pp. 84ff. ISBN 0801489121. ^ "Archived copy". Archived from the original on 3 May 2013. Retrieved 10 April 2013. CS1 maint: Archived copy as title (link) "The promise of Abenomics"
This page was last edited on 17 April 2019, at 15:21 (UTC).